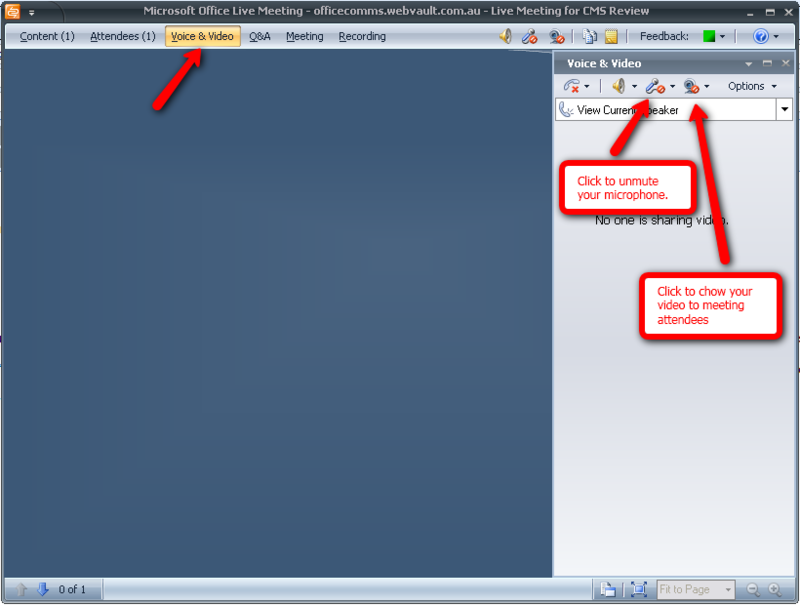 To attend a Microsoft Office Live Meeting you need to install the Office Live Meeting 2007 client software. Click here to download and install the software for Microsoft Windows. If you are not running Microsoft windows, you cannot attend the meeting. To join an office live meeting, you must receive an invitation from the person conducting the meeting. This will normally be in the form on a specially formatted email, and if you are using Microsoft Outlook will look like the following. To join the meeting, simply click on the Join the Meeting link, in Microsoft Outlook. If this meeting request has been added to your Outlook calendar, you can double-click and open the appointment, and also click the Join the Meeting link. 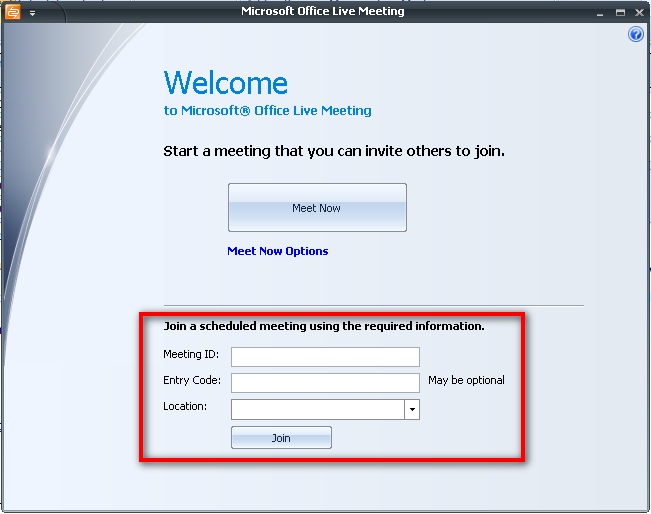 If you are not using Microsoft Outlook, then the Join the Meeting may not work. In that case, use the meeting details listed under the troubleshooting section of the email to connect to the meeting. To do this open the Microsoft Office Live 2007 Meeting client software from your Windows Start, Programs Menu. 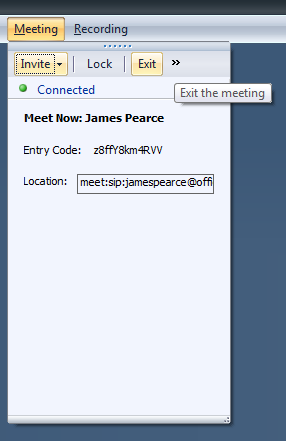 Enter the Meeting ID, Entry Code and Location details you have received for your meeting into the Live Meeting client connection window as shown below. You must enter this information exactly and so you should try and copy and paste the text from your email. Once you have successfully connected to the Office Live Meeting, you should see the following menu options. If you have not connected to a meeting before on this computer, setup and test your web camera, audio and microphone by choosing the Voice & Video menu, click on Options and then choose Setup Audio and Video. Once you have setup your audio and video, you are ready to participate in the meeting. 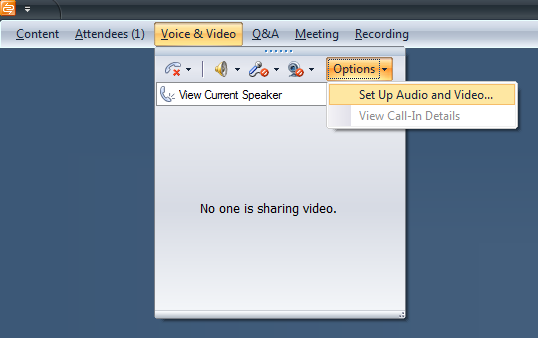 When ready you should open the Audio and Video dialog window inside the meeting using the menu, and click the buttons as shown to unmute your microphone and send your video feed as required. By default your microphone and web camera will be muted when you first enter the meeting. You must enable these so that other meeting attendee's can hear or see you. To exit the meeting when finished, click the Meeting menu and choose the Exit option.